As usual in evolutionary speculations, the narrative takes prominence. Disciples of Papa Darwin see what they want to see. This happens quite a bit, and is especially prominent in their desire to find dinosaurs with feathers. There are two examples of bad science and evolutionary wish making in this area. Why are they so determined to see feathers on dinosaurs? Those owlhoots demand them for their unfounded belief that dinosaurs evolved into birds, and they sure can't allow that God created everything. So they find some filaments and cry, "Yee haw boy howdy! Feathers on dinosaurs!" Of course, they conduct poor science and use bad logic by ignoring other possible explanations for what they have found. The evidence actually refutes their claims and also supports special creation. We saw a previous report that scientists "saw" something that kinda sorta looks like maybe it could be related for feathers, but looks nothing like real feathers. They haven't made any progress in saving face. Also, another critter has been dubbed a dinosaur, so hooray for feathers (yawn). Of course it has feathers, ya idjits, it was a bird in the first place. 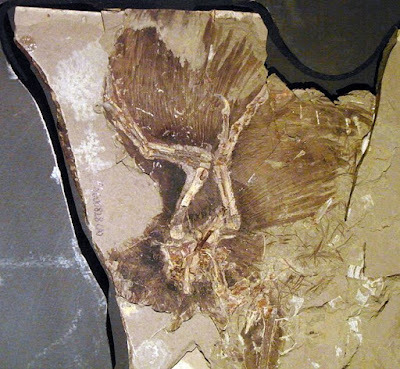 To read the rest, click on "New Fossil Feathers Affirm Created Kinds".